After the amazing BossBMC2018, we are back to bring you another ground breaking, Liverpool shaking, crazy hairy night of boss-ness. 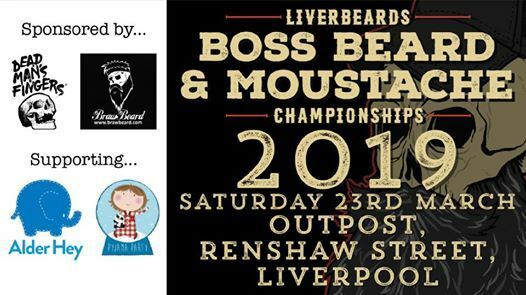 The Boss Beard and Moustache Championships return for its second year with an all new host, Liverbeard Drew and an all new venue, Outpost! We will have the usual categories including big beard, medium beard, small beard, partial and stubble. Along side these come the categories for anyone and everyone. Last year we covered each other in squirty cream, we managed to get a plastic kestrel in a beard and we had a full face fake beard made of Pom-poms take to the stage... Who knows what wild card categories we will have this year! 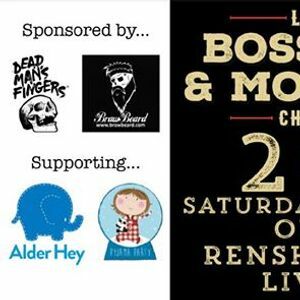 There will be boss live music, boss local and international craft beers, boss raffles and boss people. Money raised on the night supports the amazing Alder Hey and Pyjama Party Liverpool. The event is also being sponsored by the amazing Dead Mans Fingers, the best rum you can buy. Head over to the link to check them out, and even better, buy a shot at the champs! All full beard categories include styled and natural beards and moustaches. These categories are measured from the bottom lip. Anything measuring around an inch from the chin bone. We want to see some facial flesh! If you shave a bit and keep a bit this is the category for you! Includes goatee, amish and chops! Geoff from Byker Grove, Charles Bronson and Tom Selleck all had moustaches, if you have as well, this is the category for you! Didn't shave for the last 2 days? We are proud of you. This is your chance to shine and be forced to keep it growing. Did nature not bless you with hair follicles? Then get busy building one! Think outside of the box, then cut the box up and go wild with that glitter! Don't have a beard? Well you need one. No need to sign up for this, if you're in the room without facial fuzz you're in! This is what you are really coming for, right? Last year we had DIY beard in 2 minutes, squirty cream beard and how much stuff can you get in your beard? Who knows what we will get up to this year! Keep up to date and in the know by hitting ‘going’ and don’t forget to invite your friends. This event WILL sell out so please buy early to avoid disappointment. If you have received a free ticket at a competition throughout the year, you will need to get in touch to be placed on the guest list. Anyone not doing this, we may not be able to grant you entry on the night. ALSO... physical tickets WILL NOT be sent out to you. Once purchased, all names and number of tickets bought will be kept on the door ready for your arrival on the night.